In consequence of a number of stunning catastrophes, Arthur Dent is surprised to find himself living in a hideously miserable cave on prehistoric Earth. However, just as he thinks that things cannot possibly get any worse, they suddenly do. He discovers that the Galaxy is not only mind-boggling big and bewildering but also that most of the things that happen in it are staggeringly unfair. First I have to say while I had read the first two books numerous times I realised that I really had neglected reading these later parts of the series. I read them years ago but they just did not grab me like the others had and rereading them now I understand why. 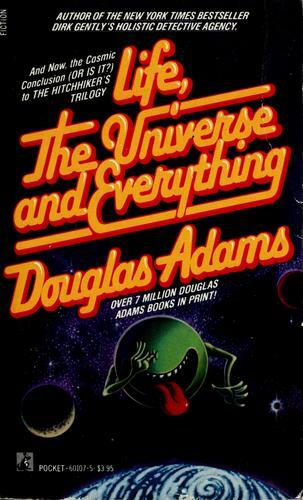 Adams is of course witty throughout but the story-lines become increasingly complex, and while I did enjoy it still I can see how the younger me got distracted. I almost thing it would have been better if this and the next three books had been put together however I understand why they weren’t firstly the size of book and secondly the publishers would have wanted to make as much money as possible. I do think that this could never have been the final book, there would always have needed to be another instalment. While I did not feel as invested in this book as much as the previous two there are nonetheless some moments of sheer genius and I will certainly pass it on to my son when he is older. The rating for this is slightly lower than the first two with 4.5 out of 5. Maybe I’ll get around to giving it a go one of these days.